Not too strong, not too light – it’s just right! Jescar Medium Polish is a machine polishing compound formulated with a new generation of high performance aluminum oxide suitable for all paint systems, including scratch-resistant clear coats. Jescar Medium Polish is capable of removing up to 2500 grit sanding marks, moderate to severe swirls and scratches, and light oxidation. With a finish that other products cannot quite compare to, Jescar Medium Polish is the perfect addition to any paint correction stock. Have you ever had that car that, while it still needs some paint correction work, isn’t that bad? You don’t want to use a product that’s TOO abrasive, but you still need to remove some light imperfections? That’s where Jescar Medium Polish comes in! Formulated to remove light to moderate paint defects, like swirls, light scratches, light oxidation, and more, Jescar Medium Polish acts as the perfect “medium” polish – not too heavy, not too light! Use Jescar Medium Polish with a foam polishing pad will polish your paint to perfection! 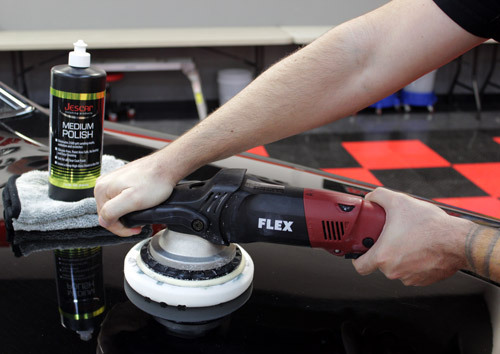 Removing swirls and scratches from your paint is the first step to having the perfect finish. And with so many compounds, polishes, and cleaners on the market today, it’s sometimes hard to find the right product for you. Jescar wanted to create a product that stood out – and they did so by using advanced aluminum oxide abrasive technology in their Medium Polish. Jescar Medium Polish is silicon-free (body shop safe! ), paint area safe, no dusting, and easy to clean up! Jescar Medium Polish finishes with a deep gloss in just one step – you may not even need a follow-up step! When you need something that’s “just right”, Jescar Medium Polish is what you’ve been searching for. Shake well before using. Do not work on hot surfaces or direct sunlight. Apply 3 to 4 pea sized drops of Jescar Medium Polish even only the surface of a foam polishing pad. Work in a 2 x 2 sq. ft. area using medium pressure and speed until defects are removed and the polish breaks down leaving a clear film over the surface. Wipe off the residue with soft microfiber buffing towel. For the ultimate paint surface protection, follow with a layer of Jescar Power Lock Plus polymer sealant. Jescar Medium Polish 32 oz. Jescar All-In-One Polish & WaxJescar All-In-One Polish & Wax 32 oz.Jescar Medium Polish 32 oz.Jescar Correcting Compound 8 oz.Jescar Correcting Compound 32 oz.Jescar Micro Finishing Polish 8 oz.Jescar Micro Finishing Polish 32 oz.Jescar Color Lock Carnauba Wax 16 oz.Jescar Paint Refresh Professional Grade Detail SprayJescar Top Finish Machine Glaze 32 oz.Jescar Power Lock Polymer Paint Sealant 16 oz.Jescar Power Lock Polymer Paint Sealant 32 oz.